Ground wild turkey is healthy and easy to cook. Debone the tougher leg and thigh meat and grind with the breasts, and you won’t have to fuss with complicated cooking methods and cooking times had you kept them whole. Instead, what you get is a lean, flavorful protein that can substitute any ground red meat in your favorite recipes, including burgers, meatballs, casseroles, and even meatloaf. I use the same spices, cooking times, and methods, and I heartily find that ground wild turkey can stand well on its own. 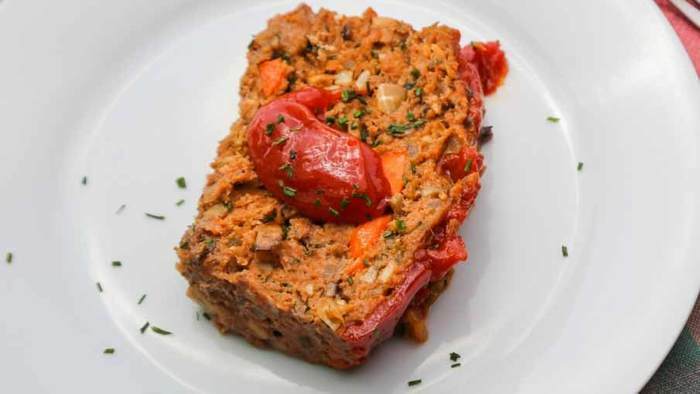 This recipe is the healthier version of classic meatloaf. Lower in fat and with a good helping of chopped onion, carrot and celery blended in, maybe this is the recipe that will get the pickiest of diners at your table to eat their vegetables. And the mushrooms that speckle the loaf also contribute a savory, toothsome bite to the dish. I enjoy this dish best the day after—so it’s great for making ahead— when the loaf has cooled in the refrigerator and is easy to neatly slice. I then brown the slices in a hot pan with some olive oil, which adds a flavorful crust. 1. 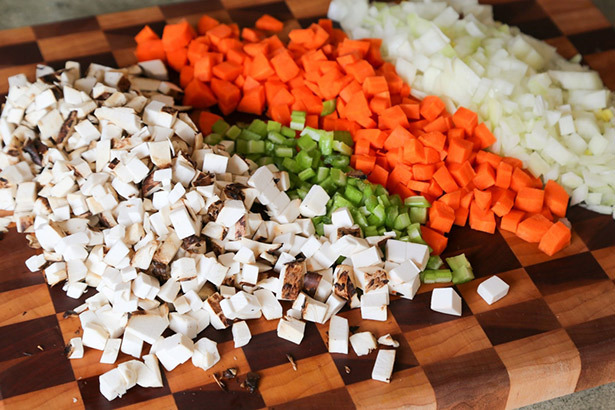 Preheat oven to 350 degrees F. Finely dice mushrooms, onion, carrot and celery. In a large skillet—the more surface area, the better—coat bottom of pan with oil and turn heat up to medium-high. Once hot, add diced mushrooms into the pan and sauté until mushrooms have given up most of their moisture and are slightly browned, about 10 minutes. Add a pinch of salt and chopped thyme leaves toward the end. (You want mushrooms to be as dry as possible, without getting crispy, so they don’t get too watery later in the meatloaf.) Once cooked, transfer mushrooms to a large bowl and set aside. 2. Coat the same pan with more oil. This time, add the onion, carrot and celery and a pinch of salt. 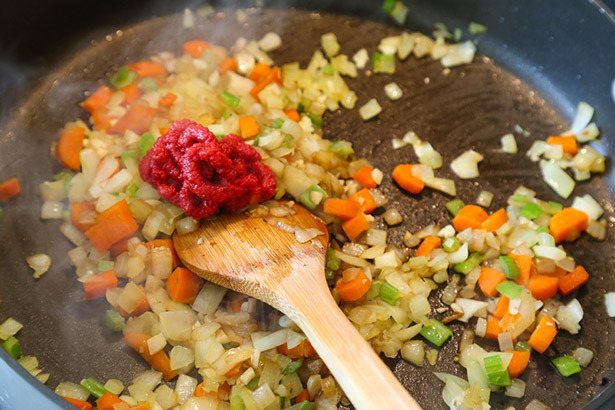 Sauté vegetables until onion softens, about 5-7 minutes. Then add garlic, Worcestershire sauce, and tomato paste, and then sauté for another 30 seconds. Transfer vegetables to the bowl with the mushrooms and then allow mixture to cool. 3. Once vegetables and mushrooms are cool, add ground turkey, parsley, breadcrumbs, 1 teaspoon of salt, shredded cheese and ground black pepper to the bowl. Combine with your hands. 4. Spray a standard 9 by 5 loaf pan with cooking spray. Evenly spread turkey mixture into the pan. In a small bowl, combine ketchup, brown sugar and dry mustard. 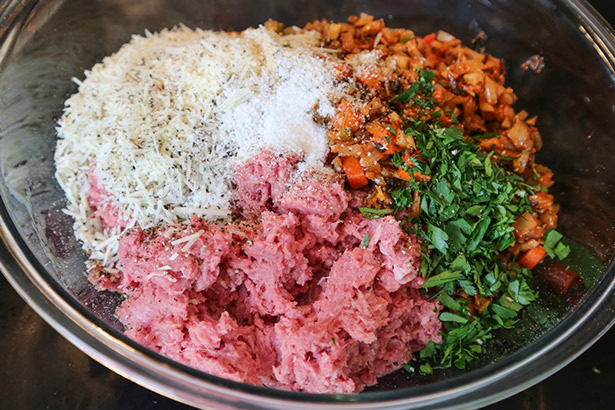 Spread a layer on top of the turkey meatloaf, reserving the rest for serving. Bake in a 350-degree oven for 1 hour, or until internal temperature reaches 160 degrees. 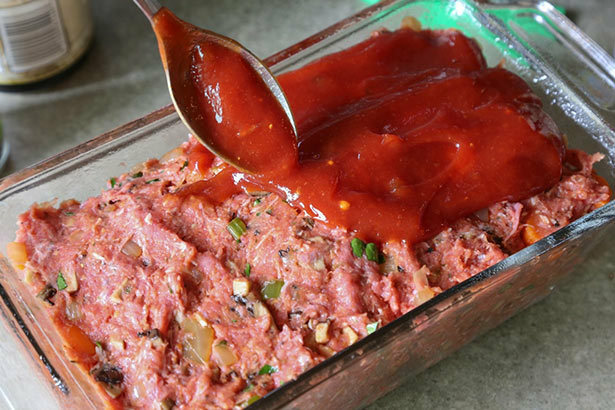 Allow meatloaf to rest for 15 minutes before cutting and serving. Serve with leftover ketchup mixture on the side.